Whoa!! Would you look at that!! 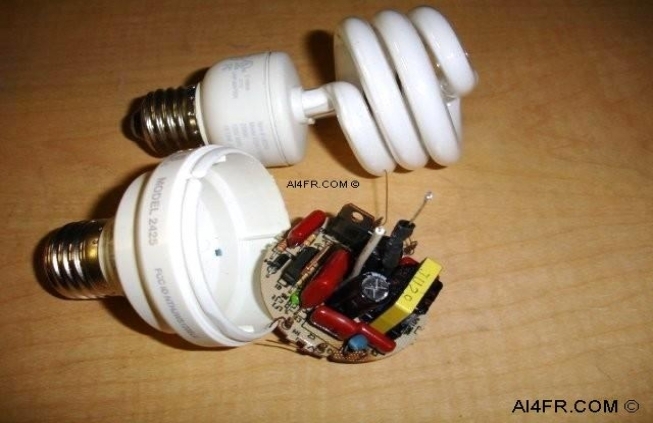 There are parts galore inside these energy saving compact fluorescent lights(CFL). Who knew? This little tidbit is not really a repair tip but a "how to" on getting some spare parts. If you are any thing like myself, if it is electronic and its broke, we either fix it or dig into it for spare parts. I even have the word out to all of the neighbors to not toss out any unwanted electronic items. Anyways and getting back to the topic on hand, the picture shows a trick that is not yet very well known for picking up a few spare parts. Simply and carefully(glass and mercury) take apart any of the "green" bulbs that happen to burn out. Inside there are a number of capacitors, diodes, transistors, resistors and a small transformer among other goodies. I use a Hakko 808 desoldering gun and can have the components off the board in just a couple of minutes. From there, I separate them and put each one in the appropriate parts container for later use. Now, besides picking up a few extra parts from an unknown source, you also know one of the reasons why these bulbs costs us what they do. If you preform this tip, please keep in mind that the manufacturer warns us that inside of the glass element it contains Mercury and should be disposed of in accordance with local and state laws. Why stop there? Let's take a look at what some electronic experimenters have created from these CFL's. AA1TJ took a defective "TriMax Electronic Fluorescent Lamp," Model # SKT320EAH CFL that was made in Korea for MaxLite and built a QRP CW transmitter from the salvaged components. He reports that the only additional parts that were needed was a quartz crystal and four components that were used to construct the output lowpass filter. The result, a transmitter that can produce up to 1.5 watts on 80 meters with a 24 volt DC power supply. Do these bulbs create enough RFI to cause problems with radio amateurs? A typical warning found on these bulbs reads as follows, "This product complies with Part 18 of the FCC rules, but may cause interference to radios, televisions, wireless telephones, and remote controls. Avoid placing this product near these devices. If interference occurs, move product away from the device or plug either into a different outlet. Do not install this product near marine safety equipment or critical navigation or communication equipment operating between 0.45-30MHz.". The manufacturer also warns that inside of the glass element contains Mercury and should be disposed of in accordance with local and state laws. The long answer is that each lamp incorporates a DC power supply that in turn drives a pair of switching transistors that oscillate in the tens-of-kilohertz range. These power supplies are known as a switched mode power supply or a switching mode power supply or simply SMPS for short. They differ from a linear Power Supply Unit(PSU) in that the SMPS switches a power transistor between saturation(full on) and cutoff(completely off) with a variable duty cycle whose average is the desired output voltage. A linear power supply unit maintains the desired output voltage by dissipating excess power in a pass power transistor. Most households will have dozens of similar switching power supplies in use at any given time. They are very popular and can be found in such places as dimmer controls, light sensor, computers, TV's, monitors, light bulbs and so on. Electronic switching supplies can be made very small but are inherently noisy. Large amounts of EMI(electromagnetic interference) are generated on both the input and output sides of the switching converter. They create noise on a broad spectrum basis because the devices switch so fast that they shock excite resonant wires. A visit to the ENERGY STAR web page reveals that in order for these bulbs to be Energy Star compliant their operating frequency is required to be greater than or equal to 40kHz. RF(Radio Frequency) lighting devices such as these CFL bulbs, produce light by using RF energy to stimulate gases contained inside the lamp. These tiny oscillators must comply with EMC(electromagnetic compatibility) regulations, which for the U.S. fall under FCC Section 47 CFR Part 2 and Part 18 - Industrial, Scientific, and Medical Device requirements for consumer limits. The FCC rules limit the amount of RF voltage that can be radiated by these devices to 250 microvolts across a 50-ohm LISN(line impedance stabilization network) in the 3 to 30 MHz range. That's not much power but under some circumstances, can be heard on our ham radios. Another consideration however slight for a noise source is the ion charge exchange process which produces the light inside the bulb. An electrical current from the ballast flows through the gas, causing it to emit ultraviolet light. The ultraviolet light then excites a phosphor coating on the inside of the tube. This coating then emits a visible light that we can see. Some radio amateurs have also been able to trace their noise problem directly to these bulbs. The manufacturers obviously know there is a potential noise issue with these bulbs when used in certain situations, but reminds the consumer that their bulbs are in compliance with current FCC rules. They also advice against installing the bulbs near marine safety equipment or any critical navigation or communication equipment. The short answer is that I have dozens of these bulbs installed in my home with at least two in operation at any given time when the amateur radio communication equipment is in use. The closest bulb is installed in a ceiling fan about 10 feet away from the radio. To date, I have never experienced any interference from the bulbs from any of the manufacturers. Whoops, the glass broke. What should I do, and am I in any danger? According to a report by the state of Maine, CFL's can release dangerous amounts of mercury into the air if the glass bulb is broken. The CFL's use mercury to produce light, but they do not give off mercury under normal everyday use. Mercury is a neurotoxin that affects the nervous system causing brain, nerve, kidney, and lung damage, particularly in children and in developing fetuses of pregnant women. Although in some parts of the world, mercury is actually ingested in religious practices which has prompted the U.S. government to create a fact sheet entitled "The Use of Mercury for Cultural and Religious Purposes" . Some Caribbean based religions such as Santeria, Espiritismo and Voodoo use/sale mercury in the form of capsules in amounts that range from a few grams to 5 ounces for spiritual works(trabajos). These capsules of mercury, or the mercury itself is known as azogue in Spanish, quicksilver in English, and vidajan in Haitian Creole. The purpose of the fact sheet is to warn local health departments of the potential danger of certain "Afro-Latino-Caribbean and Brazilian based traditions" that use mercury in certain cultural traditions. Researchers from the state of Maine conducted a study where they broke 65 compact fluorescent light bulbs and then measured the mercury levels in the air before and after they tried various cleanup methods. According to Mark Hyland the director of Maine's Bureau of Remediation and Waste Management, the study found that the mercury level could exceed the federal government's chronic exposure maximums by up to 100 times. The study recommends that should a compact fluorescent bulb break, the room should be well-ventilated, and children and pets should be evacuated. NEVER under any circumstances should a vacuum cleaner or a broom be used to clean up the broken glass, even in a carpeted room. Instead, glass fragments should be removed using a stiff piece of paper or tape. The contaminated area should also be wiped down with a damp towel. All bulb fragments should be sealed in a screw-top jar and then removed from the house. The link below is a PDF document on the proper clean up procedures for broken CFL bulbs which fully explains the necessary clean up procedure.